The all-new 2012 Toyota Camry, in its seventh generation, was introduced from Los Angeles Paramount Studios and the factory at Georgetown, Kentucky. The Camry again offers three powertrain choices: a revised 178 horsepower 2.5-liter four-cylinder engine with EPA-estimated fuel economy of 25 mpg city/35 highway, a 268 horsepower DOHC 3.5-liter V6, available in the SE and XLE grades, with projected EPA-estimated ratings of 21 mpg city/30 mpg highway and a highly revised 200 horsepower Hybrid Synergy Drive powertrain, including a new 2.5-liter four-cylinder engine delivering EPA-estimated 43 mpg city/39 mpg highway/41 mpg combined. The gas-engine LE, XLE and SE models come equipped exclusively with a six-speed automatic transmission that offers a sequential manual shift mode using the console shifter. The Camry L has a base MSRP of $21,955 excluding a $760 delivery, processing and handling (DPH) fee which is applied to all models. The Camry LE is $545 more, carrying a base MSRP of $22,500, a decrease of $200 or 0.9 percent compared to the 2011 model. Four-cylinder SE models will have an MSRP of $23,000, a decrease of $965 or 4.0 percent. The 2012 SE V6 model will remain priced at $26,640. The Camry XLE will start at $24,725 for four-cylinder models, a decrease of $2,000 or 7.5 percent compared to previous model year. The MSRP for XLE V6 models will be $29,845, which is the same price as the 2011 model. The Camry Hybrid LE will carry a MSRP of $25,900, a decrease of $1,150 compared to the 2011 model. The premium Camry Hybrid XLE model features a MSRP of $27,400, a decrease of $800 compared to the previous model with upgrade package. The all-new Camry Hybrid yields a more-than-30 percent boost in fuel economy in the EPA city and combined driving cycles, compared to the previous generation, thanks largely to the new hybrid powertrain, but also due to lighter vehicle weight and optimized aerodynamics. The new Camry models with four-cylinder and V6 engines will begin reaching Toyota dealers in October and Camry Hybrid models will arrive in November. The 2012 Subaru Impreza with an all-new 148 horsepower 2.0-liter SUBARU BOXER® engine with projected EPA fuel economy of 27 mpg city and 36 mpg highway is priced starting at $18,245 for the base model 4-door Impreza 2.0i with a five-speed manual transmission, the same as last year's model. The automatic version with Subaru's newly designed continuously variable transmission (CVT) starts at $19,245. The base 5-door Impreza 2.0i starts at $18,745 when equipped with a five-speed transmission and $19,745 for the CVT-equipped model. The 2012 Impreza is also offered in 2.0i Premium, Sport Premium and Limited models – the Limited a new addition for this year. The 4-door 2.0i Premium starts at $10,545 while the 5-door Premium starts at $20,045. For the 2.0i Limited, prices start at $22,345 for the 4-door and $22,845 for the 5-door version. The Impreza 2.0i Sport Premium starts at $21,045 and is only offered in the 5-door body style. A new Sport Limited model is also available. These prices include the $750 destination charge. The 2012 Impreza will arrive in dealerships November 2011. 2013 Infiniti IPL G Convertible, based on G37 Convertible, with a 3.7-liter V6 and three-piece power retractable hardtop is coming in spring 2012. Additional information on the 2013 IPL G Convertible will be available during the production version debut at the Los Angeles Auto Show in November. The Infiniti JX Concept is a preview of a new 7-passenger, 3-row luxury crossover with a V6 engine powering an all-wheel or front-wheel drive powertrain and will join the Infiniti lineup in spring 2012. The Infiniti JX will have Blind Spot Intervention available and Backup Collision Intervention which, when the transmission is in reverse, helps the driver detect crossing objects behind the vehicle and, if necessary, the system will automatically engage the brakes to help avoid a collision. Also on th JX, a 14-speaker Bose® Studio Surround® sound system with Waveguide bass technology and an Infiniti Connection Telematics system that can automatically synch the owner’s calendar and provide navigation guidance to appointments. It will also feature the Infiniti Personal Assistant concierge service with 24-hour access to a live team of professional assistants which comes free-of-charge with every 2012 Infiniti vehicle purchase. The debut of the production version of the all-new Infiniti JX will be at the Los Angeles Auto Show in November. 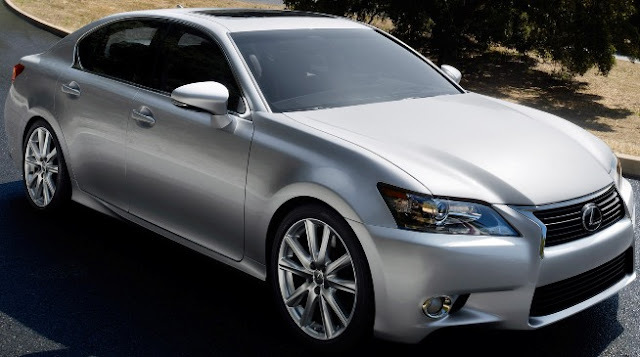 The all-new 2013 Lexus GS 350, on a more rigid platform, is powered by a 306 horsepower 3.5-liter V6, four cams, and four valves per cylinder with dual Variable Valve Timing with intelligence (VVT-i) with both direct and sequential injection taking the GS from 0-60 mph in 5.7 seconds. The transmission incorporates many features adopted from the Lexus IS F high-performance sedan, including faster shifts, earlier torque converter lockup and downshift throttle blips. There's Normal mode, ECO for better fuel economy, SPORT S to fully exploit the capabilities of the powertrain and SPORT S+ mode (available on some models) that engages handling enhancements via a sport setting of the adaptive variable suspension, steering system, and vehicle stability control (VSC) together with the powertrain enhancements of SPORT S mode. Cool stuff includes enhanced Bluetooth® capability with automatic phonebook download and streaming audio, DVD audio and video compatibility, MP3 sound enhancement, 5.1 Surround Sound, a high-resolution eight-inch central control display centrally located high up in the instrument panel, an SMS text-to-speech feature allows the driver to be read text messages and send preset responses with a compatible smart phone. HD Radio™ with iTunes tagging and a three-month trial subscription to SiriusXM Satellite Radio are standard. The Gracenote Media management system creates dynamic music playlists and a voice recognition solution recognizes nicknames for music artists and even some mispronunciations. Also available is a pre-collision system, which uses the radar cruise control system to provide early warning of upcoming objects that might result in a collision. The system also uses an infrared camera to monitor the driver's eyes to check on driver status. In the event that the driver does not appear to be looking forward when a collision appears imminent, the system will initiate the warning at an earlier threshold. If the driver still does not respond and make the appropriate maneuver, the system will initiate braking intervention up to two seconds prior to impact, helping to lessen the severity of the collision. Other available safety systems include a Night Vision System, Heads Up Display, a Blind Spot Monitor and Lane Keep Assist with Lane Departure Warning. The 2013 GS 350, equipped with 10 airbags including a knee airbag for both front driver and passenger and be available in rear or all-wheel drive, will be launched in early 2012 and be offered in hybrid and F Sport versions. The all-new 2012 Toyota Yaris Liftback, completely redesigned for 2012, arrives this Fall with a base MSRP ranging from $14,115 for the L grade three-door liftback with a five-speed manual transmission to $17,200 for the SE grade five-door liftback with a four-speed automatic transmission. The all-new 2012 Toyota Yaris is on a two inch longer wheelbase that lengthens it overall by 2.9 inches, to 153.5 inches. The height is reduced by 0.6 inches for a lower and longer stance giving it up to 68 percent more cargo room along with additional headroom and passenger volume. 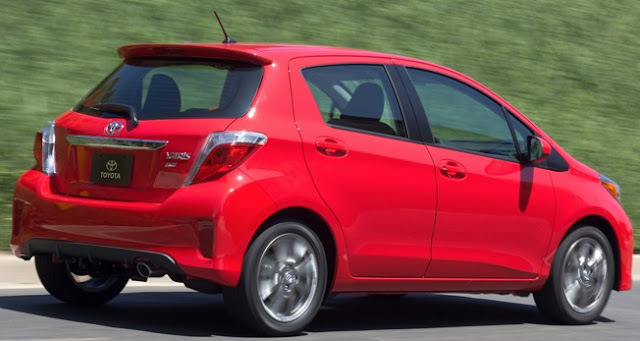 The Yaris LE includes standard power windows with driver’s auto-down, power mirrors, and a remote keyless entry system with Engine Immobilizer. The steering wheel features audio controls, and cruise control is available as an option on the LE. The new Yaris, standard with 9 airbags, will be offered in three grades, with the entry-level L and value-packaged LE editions available either as a three-door liftback or five-door liftback powered by a 106 horsepower 1.5-liter, 16-valve, four-cylinder DOHC engine equipped with variable valve timing with intelligence (VVT-i), producing 103 lb.-ft. of torque. The sport-tuned SE is available only as a five-door. All Yaris L, LE and SE models are available with a new four-speed electronically controlled automatic transmission. General Motors North America President Mark Reuss announced the launch the 2012 Cadillac XTS large luxury sedan for the Spring of 2012 and a compact luxury sports sedan codenamed ATS for the summer of 2012. The XTS is based on the XTS Platinum Concept unveiled at the 2010 North American International Auto Show in Detroit. It will offer an advanced front-wheel drive and all-wheel drive system. The Cadillac codenamed ATS is a rear-wheel drive luxury sports car to compete head-to-head with the BMW 3-Series, Mercedes-Benz C-Class and Audi A4 in the luxury market's largest segment. Reuss also announced the eAssist light electrification feature on the 2012 Buick Regal will be a $2,000 option that delivers an estimated 25-percent improvement in fuel economy, giving Regal eAssist an EPA fuel economy rating of 36 mpg highway/25 mpg city. Regal with eAssist will start at $29,530, and Regal GS will start at $35,310; both prices include $860 in destination charges. The eAssist system is a $2,000 option on the Regal base model, mated to a 2.4L Ecotec engine. Buick will continue to offer the base model without eAssist as well as the 2.0L turbo.Regal eAssist, which goes on sale this fall, captures energy created during braking to charge a 115V lithium-ion battery that powers a 11-kW (15 horsepower) motor-generator, augmenting a 2.4L Ecotec four-cylinder engine. The eAssist system also allows the engine to shut down fuel delivery in certain deceleration conditions, saving additional fuel. Based on $4-per-gallon gasoline, the eAssist option on the Regal should pay for itself in about 3 1/2 years. General Motors dealers in the United States reported 214,915 total sales in July, an 8 percent gain compared to July 2010. A 36.4 percent jump in GMC sales offset a 25.5 percent fall in July Cadillac sales. Year-to-date sales GM sales are 1,476,548, a gain of 15.3 percent. Ford's July sales totaled 180,865, up 8.9 percent versus a year ago – driven by 13 percent higher Ford brand sales and 40 percent higher sales for Lincoln. Year-to-date Ford sales are 1,253,579, up 11.8 percent over the first 11 months of 2010. Toyota Motor Sales USA reported July sales of 130,802, a decrease of 19.7 percent from the year-ago month. Year-to-date Toyota sales are 943,590, down 7.1 percent from last year. Chrysler Group LLC reported U.S. sales of 112,026, the best July sales since 2007 and a 20 percent increase compared with July 2010. Year-to-date Chrysler has sold 751,958 vehicles, up 21 percent over 2010. Nissan North America reported July U.S. sales of 84,601, an increase of 2.7 percent. Nissan Division sales increased 6.4 percent and Infiniti sales decreased 24.1 percent from the prior year. American Honda Motor posted July sales of 80,502 vehicles, a decrease of 25.6 percent, based on the daily selling rate. American Honda year-to-date sales reached 687,944, down 2.6 percent versus last year. Hyundai Motor America announced sales of 59,561 vehicles in July, a 10 percent increase compared with the same period a year ago, an all-time sales record for both the month of July and the first seven months of the year for Hyundai, breaking the marks set last year. Year to date, Hyundai sales are 382,358, up 23.4 percent versus 2010. Kia Motors America recorded its best-ever July sales of 45,504 vehicles, up 28.5 percent over the same period last year. Year-to-date Kia sales are 290,608, a jump of 41.4 percent over 2010. Volkswagen of America reported sales of 29,066 in July 2011, a 21.7 percent increase over prior year sales. Year-to-date sales are 183,191, up 22.2 percent. Separately, Audi of America reported record July U.S. sales of 9,146 vehicles, topping the previous record of 7,974 vehicles sold in July 2001. Year to date, Audi sales in the U.S. grew 15.6% to 65,055 luxury vehicles sold from January 2011 through July 2011. The BMW Group in the U.S. (BMW and MINI combined) reported July sales of 26,120 vehicles, an increase of 11.7% from the 23,390 vehicles sold in the same month a year ago. Year-to-date, BMW Group sales are up 17% to 169,641 in the first seven months of 2011 compared to 144,975 in the same period in 2010. Subaru of America announced July 2011 sales of 21,730 down 9.4 percent and 153,779 year-to-date, an increase of 2.6 percent. Mercedes-Benz USA reported July sales of 21,065 vehicles, a 16.7 percent improvement over July 2010, and the highest July volume since 2006. On a year-to-date basis, the 139,086 vehicles sold represent an 11.3 percent increase. Mazda North American Operations reported July sales of 20,783 vehicles, up slightly at 0.2 percent versus July of 2010. Sales through the first half of the year are up 4.9 percent versus last year with 143,162 vehicles sold. Mitsubishi Motors North America reported July 2011 sales of 7,972 units, an increase of 41.1 percent compared to the same month in 2010. The increase continues a sales surge that, for the first seven months of 2011, makes Mitsubishi the fastest growing automaker in the United States. Jaguar U.S. sales of 984 was a 35 percent drop from July 2010 while year-to-date sales are up slightly to 7,394 from 7,367 last year. Land Rover sold 2,811 vehicles, a 23 percent gain bring year-to-date sales to 20,103, a 17 percent increase. Jaguar Land Rover's July total was 3,795 about the same as the 3,808 sold last year. JLR's year-to-date total through July is 27,497, a 12 percent rise. Porsche Cars North America announced July 2011 sales of 2,768 units, an increase of 2 percent compared to the same period last year. So far in 2011, Porsche has sold 18,310, a 34 percent increase over last year. American Suzuki sold 2,447 vehicles in July, a 25 percent rise over 2010 and year-to-date Suzuki has sold 15,849, up 17 percent over the first seven months of last year.